The Taming of the Glue: Hearts! Morning one and all...hope the weather is going to be a bit better today. I definitely work better when the sun is shining. On a miserable day I just want to go back to bed and hide under the duvet! Anyway, to start the day with something a bit brighter, I thought I'd show you this card. It's another one from a past workshop I taught but I still like it. The colours aren't my usual ones and it's nowhere near as distressed as I usually go! I've used some of the Studio 490 stamps for this one. The stamps are a gorgeous quality and pre-mounted. I stamped the hearts twice onto white card using Crimson Archival Ink and once onto red card with Perfect Medium then heat embossed it with Cosmic Shimmer True White. The background is a piece of white card that I ran through the Grand Calibur with the Baroque embossing folder then picked up some of the embossed detail with Shabby Shutter Distress Ink. The seam binding ribbon was also coloured with the same ink. That's what I love about the seam binding...you can colour it so easily and have ribbon to match every project. The message is from the same set of stamps and has been stamped with the Crimson ink but heat embossed using CS Clear. To finish I just edged it with the Shabby Shutters. A bit of matting and layering with the top heart stuck on with 3d foam pads et voila!! A really quick and easy card. Hope you like it. 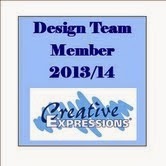 All of the products used are available from Creative Expressions. Another piccie from my travels. We visited the island of Burano in Venice and I saw these beautiful Murano glass pendants all in a bowl. They looked so stunning all mixed together with the sunlight reflecting off them that I couldn't resist taking a photo. My wonderful OH was on a different tour that day (we were both working as tour escorts) and when we met up he had bought me a gorgeous Murano Glass bracelet as a surprise. He earned MANY brownie points that day!!! Hope you have a great day whatever you're doing and thanks for visiting. Love your heart card! The murano glass pieces do look stunning!